The good thing about buying gifts for the avid reloader in your life is that there is an infinite number of tools and gadgets from which to choose. The bad thing is that it can be near impossible to narrow down the possibilities. Here’s a suggested list of stuff that we’ve found useful and that will stand up to the tests of time and tens of thousands of rounds. Even if your reloader has a progressive reloading press with an automatic primer feed, a quality hand priming tool is essential. It’s great for smaller batches and setup is nearly instantaneous. I’ve been through just about all the hand tools out there over the years and this one is my above and beyond favorite. It’s got a brilliant universal shell holder so you don’t need separate holders to fit each and every cartridge type. Of course, it will handle large and small rifle and pistol primers too. The real standout features are comfort and durability. The shape of the grips allows you to prime thousands of cases without cramps or blisters. The all-metal construction means that this unit won’t break. Trust me on that, I’ve broken just about all the other brands. MSRP on the Universal Hand Priming Tool is $79.45, but you can find it online for about $63. If your giftee is thinking about getting into reloading or is a new(er) reloader, I would be remiss in not plugging my own book – The Insanely Practical Guide to Reloading Ammunition. When you learn to play the piano, you need two things – lessons and sheet music. In the reloading world, the recipe manuals are akin to sheet music. They won’t help you much until you learn the process of reloading your ammunition safely. 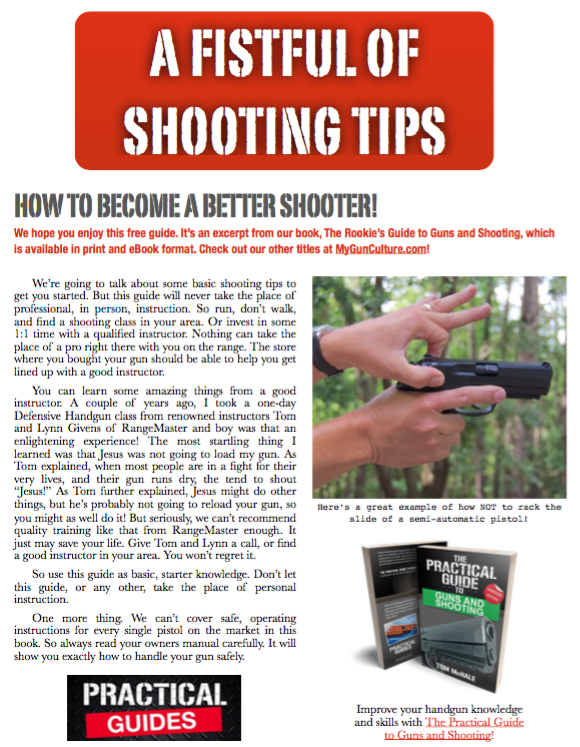 This book will walk you through the process, start to finish for rifle and pistol caliber reloading. It’s written in practical terms with easy to understand language and lots of pictures. Don’t take my word for it, check out the reviews on Amazon. People seem to appreciate the practical tips. Available at InsanelyPracticalGuides.com for $12.49. The Little Crow WFT Trimmer attaches to most any hand drill or drill press. If your reloader plans to do a larger volume of rifle cartridges in the same caliber, check out the Little Crow WFT (World’s Finest Trimmer) Case Trimmer. These are single-caliber tools, so it’s not the best bet if you plan to do small volumes of many different calibers. However, if you’ve got a bucket of .223, .308 or some other common caliber brass, it’s a great solution. Mount the unit to any drill, make a one-time case length adjustment, and you’re off to the trimming races at a pace of 10 per minute or more. I turn my Dewalt drill upside down, hold it steady with a bench vise, zip tie the speed to a medium setting and feed cases by the hundreds. The original model is caliber specific so you need one for each caliber. There’s a newer model with chamber inserts, so adding a new caliber requires a $25 part instead of a whole new trimmer. Get one for about $75 plus shipping.